Your golf cart steering wheel is a collection of parts, from the column cover, the adapter pieces and billets, to the hub and more - and we have it all. Golf Cart King has the premium accessories to trick your golf cart out and make it look great. We offer all of these parts at discount prices, so browse our collection and see what we can do for you. We can offer something that goes above and beyond the factory steering wheel that comes with your golf cart. We carry a full line of custom steering wheels, including the mustache style, 3-spoke trike style, and many more unique options. We carry after-market steering wheels for all of the major golf carts brands. We have lots of accessories, including chrome billet covers, deluxe steering wheel spinners, and scorecard holders with clips. These are made to fit all of the major makes of golf carts including Yamaha, Club car, and EZ-GO. Be sure and take a look at our steering wheel covers and hub adapters to give your golf cart one-of-a-kind appeal. Our line of steering wheel adapters is manufactured to fit all golf cart models. Be sure and take a look at our polished billet 5 and 6-hole steering wheel adapters. We carry wood grain, stainless steel and Euro style steering wheels for Yamaha, Club Car, and EZ-GO golf carts at the best possible prices. Take your pick of 2, 3, or 4-spoke steering wheels, and enjoy looking through our wide selection of upscale products. 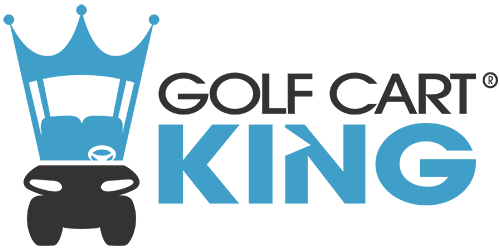 When you are trying to create a custom look with accessories for your golf cart, let Golf Cart King make your dream a reality - at a lower cost than any of our competitors!